A passion for animals led Army Ranger Patrick Montgomery (left) to the University of Missouri, where he earned an animal sciences degree. 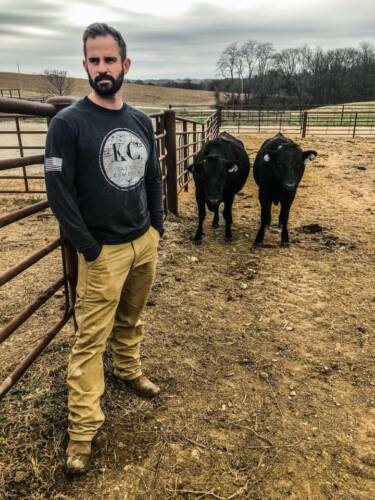 He combined that passion with an interest in entrepreneurship to create the KC Cattle Company. The company raises quality wagyu beef – and Montgomery has worked hard to help veterans get back on their feet. The farmers and ranchers at the KC Cattle Company are all veterans. Photo courtesy Patrick Montgomery. Tuesday, Sept. 11, 2001, began just like any other day for sixth grader Patrick Montgomery. When the day ended, Montgomery had a new purpose and focus. Montgomery watched terrorists attack the twin towers that morning and spoke to his father that night. He said that if the United States went to war, and if the war was still going on when he graduated high school, he would like to help protect his country. Montgomery graduated in 2016 with a degree in animal sciences. During his time in the College of … Expand ▸Montgomery graduated in 2016 with a degree in animal sciences. During his time in the College of Agriculture, Food and Natural Resources, Montgomery figured out that animal medicine wasn’t for him. The ranch life seemed like a much better fit. As Montgomery began to look toward his future, a conversation with a former Ranger laid the foundation for the KC Cattle Company. Photo courtesy Patrick Montgomery. Montgomery went through the grueling Ranger Assessment and Selection Program two years after graduating from Park Hill South High School in Riverside, Missouri. The eight-week course in Fort Benning, Georgia, pushes its future Army Rangers to the brink both mentally and physically. Montgomery was encouraged to go the Ranger route by his brother-in-law, Jeremy Katzenberger, an Army Ranger. Katzenberger married Montgomery’s sister, Colleen, when Montgomery was in tenth grade. The two were incredibly close, meeting in 2003 when Montgomery was in eighth grade and Katzenberger was in college. Montgomery powered through the Ranger Assessment and Selection Program and was honored with a place among the Army Rangers. Montgomery and the rest of his battalion were deployed a couple months after graduation, in 2011. Just a few weeks into that deployment Montgomery’s world was shaken. Katzenberger was killed in the line of duty. Montgomery, only 21 years old, escorted Katzenberger’s body back to the United States. Visit the KC Cattle Company website to see what cuts he has for sale. You can also follow along with … Expand ▸Visit the KC Cattle Company website to see what cuts he has for sale. You can also follow along with the company on Facebook, Twitter and Instagram. Photo courtesy Patrick Montgomery. Montgomery completed his military contract and was then left at a crossroads. “I was considering two paths,” Montgomery said. “My first option was to apply for a more dangerous unit. My second option was to get out of the military completely. My girlfriend, who is now my wife, was kind enough to help guide me without telling me what I should be doing. She asked if I had given any thought to what interested me on the civilian side of things. I hadn’t thought about anything – I thought I was going to be in the military my entire life. Montgomery knew Katzenberger would want him to attack a new goal with the same passion he had attacked his Ranger training. A passion for animals led Montgomery to the University of Missouri, where he earned an animal sciences degree, 2016. He combined that passion with an interest in entrepreneurship to create the KC Cattle Company. The company raises quality wagyu beef – and Montgomery has worked hard to help veterans get back on their feet. The farmers and ranchers at the KC Cattle Company are all veterans. “When the KC Cattle Company first began, I had a buddy from my regiment who came down and stayed with me for a few days,” Montgomery said. 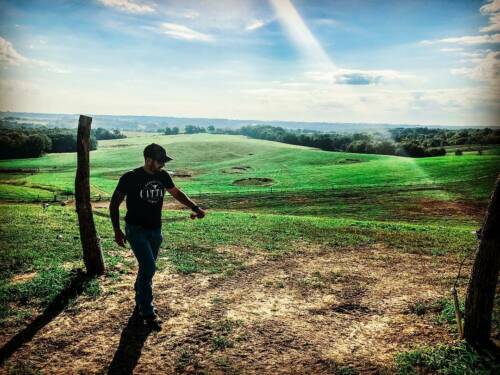 “We were out working cattle, and he thought it was phenomenal. He told me that when I started hiring, I should really consider an all-veteran staff. I hadn’t given much thought to the makeup of my future staff, but this made a lot of sense. After deciding to not renew his contract, Montgomery relied on that training to mold a new path as a civilian. Montgomery’s girlfriend, Kaleigh, who is now his wife, sent him several ideas related to his passion for animals. She suggested he become a veterinarian. Montgomery said they harvested around 60 head of cattle in 2018. The company sells a variety of … Expand ▸Montgomery said they harvested around 60 head of cattle in 2018. The company sells a variety of wagyu products, including hot dogs, summer sausage, brisket, ground beef, rump roast and several other premium cuts. 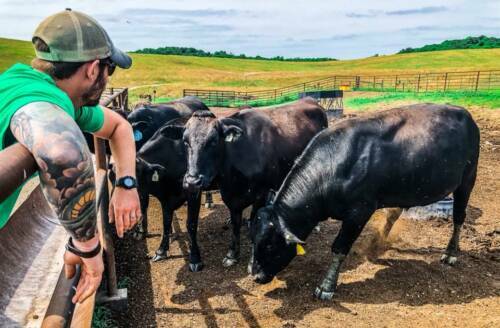 Montgomery added that they will harvest closer to 150 head of cattle in 2019. Photo courtesy Patrick Montgomery. Montgomery did some research, though. He found out that he qualified for the Missouri Returning Heroes Act, which provides reduced tuition for certain combat veterans. Combined with a few grants, Montgomery decided that he could make it work. He reached out to the Division of Animal Sciences at MU and was put in touch with Trista Strauch-Safranski. Montgomery graduated in 2016 with a degree in animal sciences. During his time in the College of Agriculture, Food and Natural Resources, Montgomery figured out that animal medicine wasn’t for him. The ranch life seemed like a much better fit. As Montgomery began to look toward his future, a conversation with a former Ranger laid the foundation for the KC Cattle Company. Montgomery’s military training and never-say-die attitude carried over as he began to form the idea. When Montgomery began to pitch the idea of the KC Cattle Company around, there were a few doubters. Montgomery didn’t slow down, however. His first focus was on acquiring land. “Tracking down land was an absolute nightmare,” Montgomery said. “Everyone I talked to wanted me to go further north, as the land was cheaper. For the type of business I’m running, it was vital for me to be in a community that is focused on the farm-to-table movement. Montgomery found a farm in Weston that was move-in ready. The cost was right and the operations were ready. The KC Cattle Company had found a home. It was important for Montgomery to make the KC Cattle Company unique. Montgomery felt wagyu beef would do just that. Wagyu is a Japanese beef cattle breed. The term wagyu refers to all Japanese beef cattle, as … Expand ▸Wagyu is a Japanese beef cattle breed. 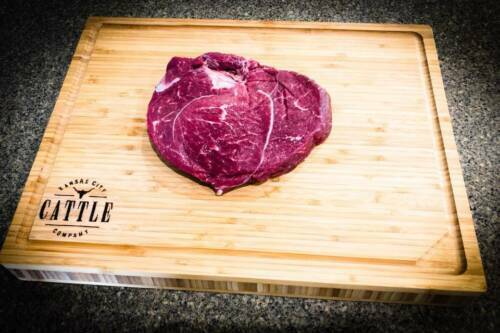 The term wagyu refers to all Japanese beef cattle, as ‘wa’ means Japanese and ‘gyu’ means cow. The breed was primarily used as draft animals early on in Japan. That work would eventually lead to an accidental benefit. Photo courtesy Patrick Montgomery. Wagyu is a Japanese beef cattle breed. The term wagyu refers to all Japanese beef cattle, as ‘wa’ means Japanese and ‘gyu’ means cow. The breed was primarily used as draft animals early on in Japan. That work would eventually lead to an accidental benefit. Wagyu found its way to the United States in the 1970s. A bigger push came in the late 1980s and early 1990s. The last shipments would become the foundation for American wagyu beef. Montgomery said they harvested around 60 head of cattle in 2018. 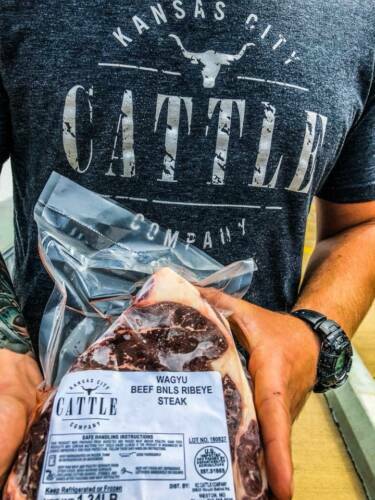 The company sells a variety of wagyu products, including hot dogs, summer sausage, brisket, ground beef, rump roast and several other premium cuts. Montgomery added that they will harvest closer to 150 head of cattle in 2019. Montgomery said the early part of 2018 was a bit of a roller coaster. 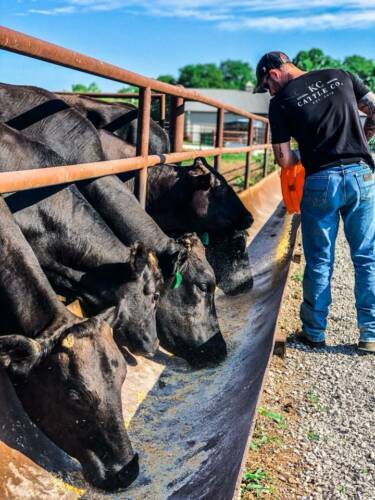 He was still trying to get his footing as an entrepreneur – and trying to make the KC Cattle Company a sustainable business. Montgomery has plans to grow his business even more this year. He is looking at adding pork and … Expand ▸Montgomery has plans to grow his business even more this year. He is looking at adding pork and chicken products, offering tours and farm-to-table dinners, and investing in exciting partnerships with veteran organizations. Photo courtesy Patrick Montgomery. During that time, Montgomery also found out that Kaleigh was expecting their first child. He decided that he would give himself nine months to get the company to a break-even or profitable point. If that didn’t happen, he would look for a new job. Montgomery has plans to grow his business even more this year. He is looking at adding pork and chicken products, offering tours and farm-to-table dinners, and investing in exciting partnerships with veteran organizations. Montgomery keeps in contact with several of his professors from MU. Bryon Wiegand (professor) helped Montgomery find a meat processor. Scott Poock (associate Extension professor) and Stacey Hamilton (instructor) helped Montgomery develop a rotational grazing plan. Montgomery said he continues to stay in touch with Strauch-Safranski as well. The KC Cattle Company offers a variety of cuts for sale. Photo courtesy Patrick Montgomery. Montgomery has built a following – and is continuing to build the KC Cattle company. He has been featured in numerous national publications, including the New York Times and Feast Magazine, as well as several local spots, such as WDAF-TV and KSHB. While there are still tough days, Montgomery relies on his Ranger training, and the memory of Katzenberger, to battle through. Visit the KC Cattle Company website to see what cuts Montgomery has for sale. You can also follow along with the company on Facebook, Twitter and Instagram.